Hello and happy Tuesday, hope you've all had a lovely bank holiday and enjoyed the sunshine! We had very relaxed weekend enjoying this glorious weather with a BBQ and wandering around Chorlton. I enjoy these low key weekends just as much as the busy ones, it gave me some time to enjoy our house before rushing back down to London for work. This weather has inspired me to update my wardrobe so I’m ready for whenever the sun shows his face! Like most I turn to dresses for the summer months to look stylish and keep cool. 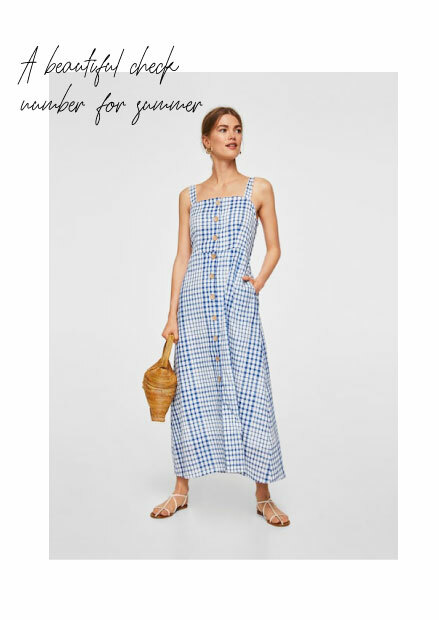 This summer season I’ve found myself leaning more towards midi and maxi dresses, for a more stylish piece to wear on a day to day. For years I thought because I’m small I couldn't get away with maxi dresses - a mixture thinking they didn't suit me and thinking when on earth would I wear them apart from my holidays. Well this all changed after I found this floral dress from H&M last year. I’ve worn this midi dress so many times since as it ticks two boxes I want when looking for clothes and shoes now, comfort and stylish. So for this summer I headed back to H&M and found this floral dress, perfect for summer days in the city. I love the awkward length and how I could wear heels with it but I think it’s also chic with some black flat sandals. After wearing this I’m already on the hunt for another midi/ maxi dress for our trip to Bordeaux and Paris next month, so I’ve picked out some of my favourites from the high street. I’m torn between the cream Zara buttoned down style and the blue check strappy Mango dress. Both would be great to wear for a wine tasting day! Let me know which style you love the most.